MOST critics are in admiration of Mike Leigh’s films, from those short, hard-hitting dramas for the television audience, like Meantime, to the films of the late 1980s and the 1990s, High Hopes, Life is Sweet, Naked (Best director at Cannes, 1993), Secrets and Lies (Palme D’Or, Cannes, 1996), Career Girls and his portrait of Gilbert and Sullivan, Topsy Turvy. Most audiences who see the films – unfortunately, they are still considered ‘art house’ fare – admire them deeply. There is one element of criticism, however, that sometimes creeps in. And it did so for his 2002 film, All or Nothing. Is Mike Leigh being patronising to his characters? They are working class East Londoners, most of them struggling to keep ahead in their daily lives. Is the director taking a stance of superiority over his creations? It’s a point of criticism that any dramatist, screenwriter or director has to be ready for if they try to portray – especially warts and all – the working class. Ken Loach usually gets away with it because he is obviously so committed to social and socialist justice. Leigh is not so overtly critical of the politics of justice. But that seems to be where both his head and his heart are. However, All or Nothing is the title of Mike Leigh’s moving picture of families on an East London estate day by day. We, the audience, are immersed in a culture to which many ‘art house’ audiences will be tempted to feel superior. It is Leigh’s genius and that of his cast who work for months improvising their characters so that they will be real and credible that the film is both real and credible. Leigh then takes the best of the improvisation and writes a tight script which the cast then follow meticulously during filming. The film opens with Rachel, a domestic worker in a hospital, mopping the floors, slowly, carefully. She then attends to the patients, checking their pillows. We, the audience, know where we are – in the mundane ordinariness of our lives. 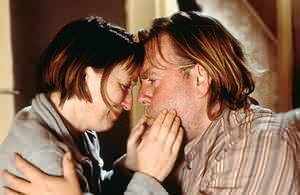 If we take Timothy Spall’s character, Rachel’s father, Phil, a London taxi driver, we spend quite a deal of time in the taxi with him, mainly listening to the range of customers he picks up. Like him, we glance in the rear vision mirror to check them out, what they look like, how they are dressed, what they sound like, whether they are sympathetic or aggravating. When Phil goes home, it is the same routine every night, a critical comment to his obese son, Rory, a kiss for his common law wife, Penny, and then the evening meal where the family struggle to make conversation or move beyond the tried and true questions about how the day was. Rory can’t wait to get away from the table. Phil withdraws into a semi-passive state, especially in the bedroom with Penny. He can’t get himself out of bed early in the morning. He laments his lack of skills. When he tells her that he did not accept a fare from a passenger he judged did not need to pay, Penny berates him. He is capable of interactions as can be seen in a long (perhaps too long) scene where he drives an impatient and garrulous Frenchwoman who deals in antiques. But, it all gets him down and he takes time off to drive to the coast and simply stand on the beach watching the water. He is moved to reflect on life, death and being alone. Because he is out of phone contact, he misses Rory’s collapse and arrives late at the hospital to be with his son. Penny works at the checkout at Safeways. She is a little more outgoing through her neighbour and fellow worker, Maureen. While Penny keeps the family going, she is becoming more exasperated with Phil. But it is through Maureen that Leigh shows his admiration for his characters. She is the mother earth character, insofar as there can be one upstairs in a block of flats in an East London housing estate. She has a great sense of humour, even in dealing with her want-to-be-married daughter whose boyfriend is the bullying, drinking, sexual macho type. Maureen takes Penny for an outing to the pub and shows she is no mean singer. She can be serious as well. It is she who really takes practical charge when Rory collapses. In this way, Penny and Maureen complement one another as the supports of their families. Leigh’s character gallery is quite extensive. Rachel, like her mother, is a carer. Rory is suffering from poor self-image and unemployed idleness and anger. There are other neighbours and cab drivers, like Ron and his family, and the brother and sister, Neville and Dinah, who run the cab company. There is Jason, the misfit, who keeps vigil watching Maureen’s daughter and develops into a stalker. Leigh’s invitation is for the audience to come into this world, identify with the characters and empathise with them.